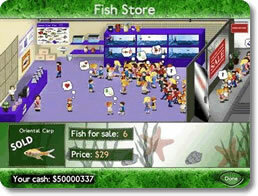 Fish Tycoon Game - Download and Play Free Version! Run a successful fish store by breeding new and valuable fish! 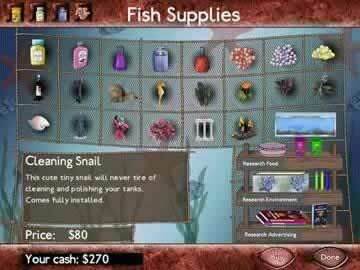 Fish Tycoon is definitely not your average simulation game. What other game lets you turn off your computer, come back to the game, and see how much your fish have grown in the time you were away? Real time simulation - the game works even when your computer is off!! Instead of waiting around for your fish to grow bigger, go ahead and turn off the game. Go get some lunch, go to school, go to work - whatever you do, do it! 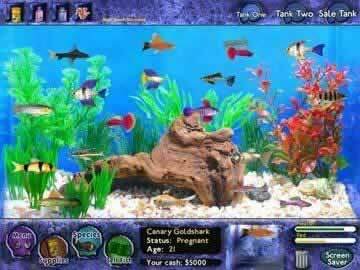 Start the game up again and you will find your fish bigger, the pregnant fish probably spawning babies, and a more mature tank than you had before. This is like having a real tank but without the fusses of cleaning and all that expense! Ever wanted to have the experience of operating a fish store? Fish Tycoon is not just a virtual tank, there is a real business involved. You must spend your money wisely, caring for your fish's every need from food to health. Buy upgrades for your tanks like ornaments and accessories. Get growth hormones to get your fish bigger faster. Buy exotic plants with health benefits. Buy eggs to get more young fish. You don't just grow and get more fish - you sell them too! When the fish are grown, put them in your sale tank, switch to the store view and you can watch the customers roll in to look at and buy your stock. Research advanced advertising techniques to help grow your store's popularity. The real challenge here is figuring out which breeds make the most money. Breed rare fish and you can make big bucks to buy more advanced items for your tank! Breed certain types of fish to get the 7 Magical Fish and win the game! Breeding fish is easy. Put 2 fish in the holding tank and one will get pregnant. Put it back in the tank and in time it will spawn new fish. You can breed up to 400 different types of fish including the 7 Magical Fish! The Magical Fish give special benefits to the other fish in your tank. Find the right breeding combination to get all 7 and you win! Player created video showing basic gameplay.